The San Francisco–Oakland Bay Bridge half dollar was designed by Jacques Shinier, a resident of Oakland, and minted in 1936. The obverse depicts a grizzly bear, a symbol of California, and the reverse shows the San Francisco–Oakland Bay Bridge, and the Ferry Building, and two boats approaching the bridge. 100,000 of these coins were minted, of which 71,369 were sold (the rest were melted down). Unlike the case with many early commemoratives, which were struck in order to find a public project, the San Francisco–Oakland Bay Bridge half dollar was, like the Panama–Pacific commemorative coins, struck in order to celebrate a particular achievement within the field of engineering. The coin was designed by Oakland resident Jacques Shinier, a Romanian immigrant, although some adjustments were made after the design was approved. In 1980, 44 years after the coin was released, Shinier signed several cards depicting him with his creation. These were sold as souvenirs and were sealed in plastic bags alongside examples of the San Francisco–Oakland Bay Bridge half dollar that were mostly graded from AU-55 to MS-63. Although they were struck no differently than the rest of the coins minted, first 200 coins that were struck were reserved for presentation purposes. Of these coins, the 22 that remained were slabbed in plastic display holders alongside documentation of their authenticity and sold to collectors. Despite interest in commemorative coins fading, sales were strong, with a total of 71,369 coins out of the 100,000 minted being sold, some from the bridge's tollbooths. The remaining coins were melted the following year. ^ a b c d "1936 S Bay Bridge 50C MS Silver Commemoratives - NGC". www.ngccoin.com. Retrieved 6 July 2017. ^ a b c d "Bay Bridge Half Dollar - CoinSite". Retrieved 10 April 2019. 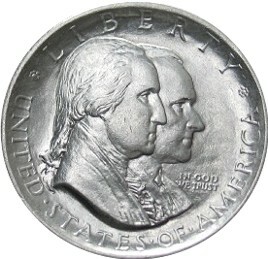 The York County, Maine Tercentenary half dollar was designed by Walter H. Rich and minted in 1936 to commemorate the tercentenary of the founding of York County. The reverse shows Brown’s Garrison, the fort around which York County was formed, while the obverse depicts the arms of York County.